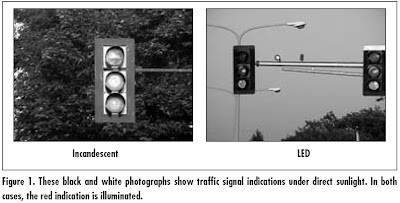 A 2003 Minnesota DOT study took a look at the color blindness affect with regard to traffic signals. The researchers specifically studied a green LED signal indication. For quick background, states began installing Light-emiting diode (LED) traffic signals in the late 1990s. The LED bulb provides significant energy savings and longer life. The problem was that the clear cover over the green indication "lit up" under direct sunlight. Because it appeared bright, it appeared to be ON to colorblind drivers, and it was so much brighter than the red or yellow indications that drivers would assume the signal was telling them to GO. A person with color vision deficiency tends to use brightness - not color - as his most important cue at traffic signals (and a number of other situations). I personally tend to see green indications as bright white. This is usually not a problem, but can become one in the scenario discussed in this paper (I can also have trouble if there is a lot of background lighting - either street lights or advertisements - in line with the signal heads). Minnesota DOT conducted a quick study (four colorblind participants and four non-colorblind) to test the theory that the current installation could be confusing to colorblind drivers. They found that 25% of the time the colorblind participant erroneously saw the green light ON when it was not (non-colorblind participants made this mistake less than 4% of the time). The Minnesota short-term solution was to replace their clear covers with colored ones, which will hopefully make the green indication much less bright in direct sunlight. But the inherent problem remains that colorblind drivers (estimated at up to 5% of the population) are generally being ignored in traffic signal design, where color is the most important factor in keeping motorists safe.